Justin Clarke is an information security consultant with years of experience in assessing the security of networks, web applications and wireless infrastructures for large financial, retail, technology and government clients in the United Kingdom, the United States and New Zealand. Justin is the the technical editor and lead author of “SQL Injection Attacks and Defense” (Syngress 2009), co-author of "Network Security Tools: Writing, Hacking, and Modifying Security Tools" (O’Reilly 2005), a contributing author to "Network Security Assessment: Know Your Network, 2nd Edition" (O’Reilly 2007), as well as a speaker at a number of conferences and events on security topics, including Black Hat USA, EuSecWest, OSCON, ISACA, RSA, SANS, OWASP, and the British Computer Society. 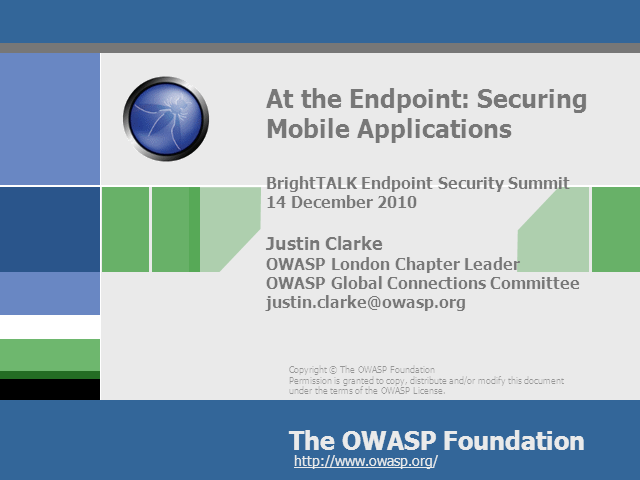 He is the author of the open source SQLBrute blind SQL injection testing tool, and is the Chapter Leader for the London chapter of OWASP as well as a member of the OWASP Global Connections Committee.